The Bariatric Surgery Excellence Award™ recognizes hospitals for superior bariatric surgery outcomes. Patients who have bariatric (weight loss surgery) at these nationally recognized hospitals have a lower risk of experiencing a complication during their hospital stay. 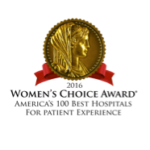 The Best Hospitals Award recognizes hospitals across the country for having outstanding female patient satisfaction. America’s Top 100 Best Hospitals for Patient Satisfaction were chosen based on patient’s willingness to recommend, doctor and nurse communications, staff help, pain management, cleanliness, and explanation of medications.